1. Capitalize on what is already there and to “grow” something new out of something old. According to the typical differences of elevation in the site, splice the repeti1 tive (triangle) units and change angles between them to get various kinds of space. 1. Respect the character of the viaduct itself: its singularity and linearity and its straight-forward pragmatism. 2. Transform infrastructure into parkland. 3. Reduce the heat island effect and create a green, pastoral place to sport and play. The site is the south Interchange of viaduct located in the juncture of the southern viaduct and the eastern viaduct in Suzhou City, Jiangsu Province. There are residential areas, factories, green space and parking lots around the site, some of which bring about the severe problems such as noise, pollution and lots of negative space. For transforming and utilizeing of the recreational amenity, my position is to build environment, synthesize Nature and assemble Ecology in the site. In this project, preservation and innovation come together through the adaptive reuse of the existing structure as a new, compelling, one-of-a synthesized combination of recreational amenity and public breathing space. 2. Organize the new paving system, which is less a pathway and more a combed or furrowed landscape, this intermixing creates a textural effect of immersion, strolling “within” rather than feeling distanced from. 3.Slow things down to promote a sense of duration and of being in another place, where time seems less pressing. Long stairways, meandering pathways, and hidden niches encourage taking one’s time. By the way of the truss structure, the plan can come into reality. Deduce appropriate space according to the height of the viaduct and needs of people. Deduce the space processing mode by analysing and intergrate the height differences. Cut the small units for smaller triangles to construct small space. Generate repetitive units using the relevant triangles as the infrustructure one. Combine them into a repeatable units. 3. Reuse the units and splice them in the whole model. Stretch the space in the northwest as three kinds of inward one which serve as shopping, plaza, cafeteria and so on. Make the open and outward space in the southeast a shopping mall for fresh vegetables and plazas for skateboarding and dabbling. Narrow zones for shopping and maximal exercise generate from the space between the external side stripes and main roads.turn the space under the viaduct into shops and plazas for amusement and exercise. 3. The site is designed to provide daily entertainment and leisure for surrounding residents based on traditional and original features of the areas. 4. The ornamental elements in the park come from the abstract of national pattems and unique elements in local architectures.On the other hand,select local crops to create ecological and high-yield environment. The geographical terrain is in line with the aboriginal culture and activities of the regional characteristics of the landscape shape. The aborigines live at the foot of the mountain, and farm in the flat with the river from the mountain on high altitude by Karez. Less people live in the Gobi which is far away from the flat. Geographical terrain, architecture, grasses, shrubs and trees were carefully selected to produce a primarily native, resilient, and low-maintenance landscape, building upon the existing self-sown landscape and working with specific environmental conditions and microclimates. The site is divided into two parts by Tianshan Mountains making Hami region various landscape, which includes four main kinds of typology. 1. The site is located in Hami, Xinjiang. The temperate continental climate is the typical climate with a character of arid, dry and sunny weather. 2. The north and east of the site is close to the mountains, the northwest of which is a natural lake and the south of it is the residential areas where the existing aborigines moved. According to the change of local lifestyles in different places from the mountains to plains and Gobi, design diversiform functional zones including activity areas in the nature, an architectural complex at the foot of mountain, public promenade- Karez which is used as a aqueduct channeling water running from mountains to the plain historical and cultural zones for amusement in Gobi. And farmland as arboretums. Some Dance and Musical Squares are designed in the park for the reason that aborigines prefer to living in a compact community. Combine mountain, building, sunken plaza. Semi-basement is used to protect from the severe cold. Shed is used to block out the sun. Reform the KAREZ to a public corridor. FARMLAND Create space with crops. Use the original desert landforms to form the recreation area. The west of the based topography is mountains, which gradually transit into slopes in the eastern areas, and in the farthest east of the site is the typical Gobi. Vast land nurtured a group of people singing and dancing. Cultural characteristics elements are extracted to apply to the feature walls and pavement. Function is in line with the aboriginal culture and activities of the regional characteristics of the landscape shape. The selection and arrangement of local culture and plants further helps to define a wild, dynamic character landscape the aborigines are familiar to. Waving hills are regional symble of Xinjiang. Hills distributes in the site gradually less from west to east with bushy forests, which leave the park a seperated and unique environment. INTRODUCTION DISTRIBUTION OF ARMLAND TEXTURE Local people like gatherings, in which people divide the meat into three people for their own use, and make almsgiving to the poor as well as relatives and friends. In the park, the aborigines are close to the rich regional characteristics in local style, the traditional ethnic and contemporary life style combined with the original inhabitants create a DISTRIBUTION OF familiar, friendly living environment. PLANT SPECIES 1.Set up large gatherings Square venue, in the form of folk instruments, such as the myth of the prototype to keep the harmonious relationship between those people. 3. Not only guide the people to understand the development of the human and natural environment during the period of the national struggle for the harmony in the historical process, but also make the residents feel the importance of the national cultural heritage and spiritual development. A dominant grassland matrix provides consistency, with punctuated and theatrical blooms of perennials, trees and shrubs for diversity, seasonal interest, texture, fragrance, and height and color variation. 2. Reconstruct the original Karez deserted many years, by changing its function and form into a unique public corridor. This part of landscape includes local representative plants with various shapes and texture, and in which camp there is some semi-underground space for people to stay. People walk in different level up and down, getting a fun experience. Based on the existing topography of the site ,transformation is the Silk Road topographic thumbnail mode.Experience diverse geographical features consisting of bunkers, rocks, grass and jungle, making the region a historical and cultural area. Due to the dry climate of the region , it is necessary to manage the stormwater of the site. The main management of rainwater contains collection and utilization of abundant rainwater from the mountains and buildings. The rainwater falling down on the roads flows to the sides of the roads. Filtrated by the layers of stone and various and plants, the rainwater finally flows to the sump. Based on the large difference between day and night, try to transform the original buildings’ shelf into a instructure which set the recirculation and utilization of condensate water out of the water evaporator. In the original native landscape, the design uses ditches, culverts, stormwater tanks, filtration grass ditches, rain gardens to collect rainwater from the building roofs and the hillsides applying to the courtyard of business district and Music Square, buildings around the living water, and water irrigation in the farmland. Meanwhile, dry creek collect rainwater from the hillsides to create seasonal landscape. The whole design of stormwater management reflects the person’s participation, native characteristics in Xinjiang, and ecological conservation of water recycling, which combines the natural circulation and artificial landscape. 1. Based on the theme of building sites and external morphology â&#x20AC;&#x201C; from the front to the background hills, the height of them changes from low to high- build the form of many stones stacking together according to the morphology with the central pool. Divided, warehouse in -1F; hall, exhibition area, recreation area, office area in 1F; display area, recreation area, overlooking the area in 2F. 2. Modify the architectural lighting according to the necessary of foyer, exhibition areas, corridors, lounge, office lighting mode. Build the corresponding external morphology and distribution of location and architectural patterns and forms. The site is a pit, located in the foot of a mountain in Yangquan, Shanxi Province. In this area, there are a lot of the mining of rare fossils and minerals found in the deep. FEATURE Change a single cube into a form of stone. Form a natural transition of space and function from the first floor to the second floor. Based on the overall evolution of one cube transform the whole body of all parts int the architecture. Form a natural transition of space and function from the first floor to the second floor. Change Fold on the plan into three-dimensional linear form. Applied to the building blocks of the body. Functional blocks are combined in the form of space distribution. External form of the building blending with the environment, reflecting its theme. The diversiform interior space of the building is based on this form. The other function of setting a pool in the atrium is to provide a use of the eco-building by the way that the roof rainwater is collected to the atrium pool connected with the outer periphery of the pool surrounding the museum where a sereis of ecological filter, water treatment and so on is setted to purify water pouring into the altrium. We proposed site D(from Bramall Lane to Ecclesall Road/Waitrose) of a new forest ring park that follows and adapts the route and adjacent sites of Sheffieldâ&#x20AC;&#x2122;s inner ring road. It is aimed at Circulation/Access, Identity and Wildness. In order to achieve the cultural and ecological functions of the new landscape, we choice the three main tree typologies which are Woodland, Avenue and Groves following the concept of chain. It provide a new way to bring more green spaces into city and to deal with the existing problems. SITE STUDY The Study Area is located west of Sheffield city. Half of the site sits within Sheffieldâ&#x20AC;&#x2122;s green belt and west suburbs, whilst the other half lies within the Peak District National Park. The total scale of the site is 3163 ha (7815 ac). Both Loxley Valley and Rivelin Valley run west to east within the Study Area. A large portion of the Study Areaâ&#x20AC;&#x2122;s land uses are devoted to pastoral farming and managed moorland. Other land uses such as small scale settlements and suburbs, dams and water treatment and amenity landscapes are also present in the landscape. PROJECT AIM The aim of this project is to plan locations and scenarios of wind turbines, which can generate 10MW, using Landscape Character Assessment. Aerial map provide an idea of field patterns, landscape uses and vegetation. Designations and specific planning policies were considered. Site of Special Scientific Interest (SSSI) and ancient woodland are shown on this map. A series of maps showing topography, hydrology, history, landcover and vegetation types, soil types and geology, habitats and land use. Overlaying natural, cultural and social factors of the site. To consider existing LCAs at different hierarchies maps available from Sheffield city council/Peak District National Park authorities were overlain. They provide an initial idea about Landscape Character Areas. From this information the final version of the Landscape Character Assessment could be produced. A Landscape Character Map showing Landscape Character Types and Areas are shown on page two. A draft LCA map was created to inform where to visit during the field survey visits. This was modified following the field survey. Consultants devised 7 Landscape Character Types with key characteristics and descriptions (the latter found in the associated supplementary paper). Within these, a total of 17 Landscape Character Areas were highlighted. Landscape character assessment ( LCA ) is a standardised system used to identify, define, classify and map variations of the character of the landscape. By doing this we may see the differences and similarities between landscapes, to consider the contribution of specific landscape elements to its overall character. LCA also provides a standpoint from which we can monitor and evaluate change across a landscape. -Rural character with footpaths and country lanes. -Dotted trees and sparse hedgerow and very occasional copses associated with farmsteads. - Upland settled rural character. -Mainly permanent pastoral farmlands (with few arable and occasional amenity areas and managed playing fields). - With rolling hills and incised narrow and tributary valleys undulating landform and cloughs. -Narrow steep valleys with mixed amenity land uses and facilities such as allotments, urban farms, park, golf courses etc. - Unenclosed heather and grass moorland, with some areas of birch scrub. - Gently rolling hill and slopes with occasional plateaus. - Rivers with historic weirs and small to medium dams and reservoirs. -Extensive footpath networks run alongside the rivers, which run west to east. -Rural character enclosures are darkened by dense woodland, hills and ridges. LANDSCAPE SENSITIVITY Landscape Sensitivity and Capacity field surveys were conducted. Results were then assessed to decide the least sensitive Landscape Character Areas. The least sensitive areas were then checked for their capacity for windfarm developments. The Landscape Character Area with the highest capacity for wind turbine development was then taken on to further study. When deciding upon layouts for the turbines the following design principles were adhered to: 1) Either orderly clusters, or orderly rows respecting land contours have been shown to be the most aesthetically pleasing. 3) Turbines should be in neutral colours, notably public preference overall leans towards white or dark grey turbine colour. DETAIL SITE SELECTION House Buffer Zones & Access Roads To be aware of the limitations of windfarm development layouts the following map shows: 300, buffer Zone from buildings - provides suggestions of locations most likely to be a suitable distance from residences to minimise visual and auditory disturbances. Access roads - provides suggestion of locations where wind turbines can be accessed easily. Peak District National Park boundary - The Peak District National Park is considered visually sensitive and so locating turbines outside this area may be logistically more suitable. Ideally , wind turbines should be situated on shallow slopes and flat ground. The information from this map was combined with the map above to narrow down options for locating the wind turbines. Although these maps have been used for inform possible scenario locations for this project, a final decision would be made by engineers. The areal views to the right give an impression of which wind turbine layout might be the most aesthetically pleasing. Two different final layouts are chosen for scenario 1 and 2 based on the turbines relationship with topography field patterns., existing vertical structures, shadows and landmarks created. Reasoning for the decisions made are given in the far right hand columns. - Research shows that wind turbines are aesthetically pleasing in cluster formation. The circle pattern means that turbines are seen this way from all distances. - The line pattern respects existing landscape features such as vegetated belts and the ridge of the hill. - This pattern type makes the wind turbines become a new aesthetic landscape element and perhaps, also a new landmark. - Mimics line of surrounding vertical features (tree lines and power lines) means that the wind turbines respect existing landscape forms. - The wind turbines follow the existing contour lines. - The plantation located on the left side of the wind farm provides a background for the turbines. - The wind turbines follow the existing filed pattern in a more organic form. Land form, surrounding vegetation and other landscape elements will all have an effect on how large the wind turbines appear in the landscape. For example, large slopes can dwarf the size of wind turbines and reduces its visual impact. Concurrently small scale hills may make even the smallest turbines look large. Studies show that turbines should appear as part of the sky rather than with a backdrop of the earth, leading a mystical futuristic quality. As well as this the intersection of turbine tower and ground plan should be concealed as far as possible. Our chosen site is relatively gently undulating, which will help achieve this appearance. Aesthetic appeal of the silhouettes, shadows created in the areal images to the right for the two scenario options will help a decision to be made regarding best scenario and layout. Build a 2m * 2m * 2m model in the atrium of the academy building to create space for people to rest, communication and entertainment for the main groups in the school. Model uses wood, rough wood, angles iron , hinges and other materials. By the way of cutting, grinding, welding, our team finally assembled model. My position in the team is the leader who proposed the original design and draw up a plan of work. With its changeable features, the model is popular among teachers and students in my academy. Change Enclosed space to transparent space. After centuries of development of the West open pit, some serious problems have gradually manifested, including air pollution, dust and flooding . In 2000,the mine took the plan of horizontal row mining to achieve a row. The current object of mine land reclamation is the former external dump. The first picture presents the history and topography of the site. First, it tells the position and satellite flat contour layers on its topography. And then it is derived from the plantoa virtual Map distinguished in a signal of red color as the lowest depressions, and yellow color as the distinguished tables. Cut it to show the mineâ&#x20AC;&#x2122;s internal ore distribution layer and the chart of the output of three main kinds of ore per year.Along with the left slope of the mountain showing the historical development, from the old era to the new era corresponding to the line from the bottom to the top, which concludes the mode of development during each period. The second graph expresses the mode of mineralmining and transportation here.Distinct the distribution areas with a series of colors stand for different modes of transport in the left plan. And the right illustrate explains the relationship between transport and terrain, and each corresponding way to the height is listed on; the lower figure reflected in the first grapgh- red block as the signal of the lowest points also represents the excavator mining method, The same details of the mineral contents are described in the cross-section, that mining methods and manual labor derived from. Keep in mind to take wisdom to understand, analyze and judge the problems, and then the answers will manifest themselves. Be not ill both in the mind and action, but do good deeds as a eternal belief. I have been learning to record the nice moments for the places I visited and traveled using my camera and pens, which would become my priceless treasure. These pictures would be the best proof of my footprints. By the way of deconstruction of the still life, I can understand its structure and restructure it and constitute parts of it into two-dimensional drawings or three-dimensional space. And then, I will decorate different morphology or function on the drawings with various kinds of materials to express its contents better. 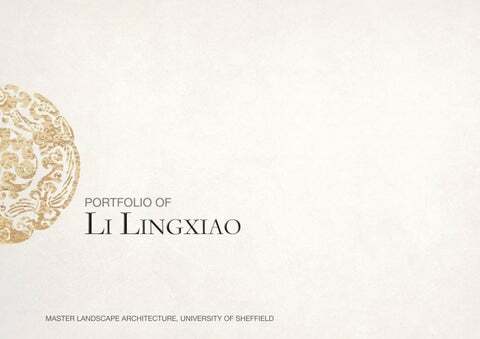 Portfolio of a student studying two-year postgraduate course in the Department of Landscape at University of Sheffield.